I know this isn't exactly Android news, but it's Android-adjacent so I've decided it counts as a deal alert. Amazon is discounting two of its Kindle ebook readers by $30: the regular Kindle and the Kindle Paperwhite. With the price drop, these now start at $49.99 and $89.99, respectively, an all-time low that we've seen on very rare occasions before. If you're wondering why I'm excited about this deal, let me tell you a short story. About two months ago, I was travelling for a week with my husband through Vienna, Budapest, Hallstatt, and we had several flights and train/bus rides to catch, so I decided I'd put the Kindle Paperwhite he had bought for his studies to good use and read on it. I loaded a few books for offline use and binge-read three books during the trip. It was amazing. My eyes didn't grow tired from looking at the screen, it was perfectly legible from many angles and in direct sunlight, I didn't get interrupted by any notifications, and the battery lasted the entire trip and wasn't even halfway through by the time we were back. It reminded me of when I was younger and had all the time in the world to read a couple of (physical) books every week. So if you're looking to rekindle (see what I did there?) 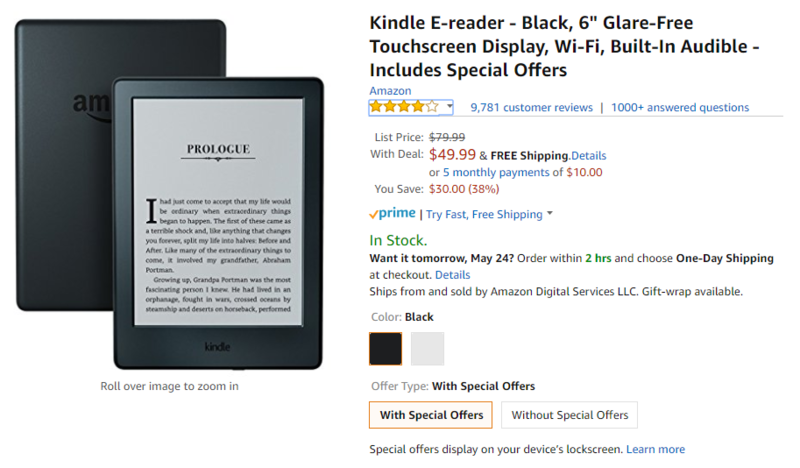 your love of reading in this fast-pacing era, or if you're already a voracious reader but want a dedicated device just for your books that lets you catch up at a more leisurely pace than the Kindle app on your smartphone or tablet, this discount should help you get started. The regular Kindle is down from $79.99 to $49.99 for the Special Offers version (ads on the lockscreen) and from $99.99 to $69.99 for the version without them. It's available in both black and white colors. The Kindle Paperwhite is also available in both colors and is going down from $119.99 to $89.99, with Special Offers. The difference in price between the two models is due to the Paperwhite's higher-resolution screen and 4 built-in LEDs that help you read in dark environments. If you're interested, the links are below.